29/11/1997: 96-90-96 = 282 points. 07/06/1997: 95-90-98 = 283 points. 15/03/1997: 100-90-96 = 286 points. 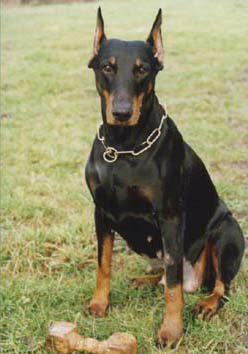 Branca von der Doberwache competed in the D.V. Meisterschaft and passed the Körung with highest rating for hardness and working drives (very high protection, fighting spirit, courage and hardness with middle sharpness). Branca's dam, Kleo von der Weyermühle, was a German Police dog who also won the working IDC World Championship in 1996 and her sire, Gero von der Mooreiche, was runner-up at the D.V. Meisterschaft in 1992 and 1996. Branca lived to 9½ years of age while her sire lived to 12 years of age and her dam lived to almost 13 years of age. Aissil: SchH 3 passed the Körung with Körklasse 2B rating. He is sire of the vom Eschenbruch “U” litter and von der Zonser Heide “L” litter. Alika: SchH 3, FH passed the Körung 'for life' with highest rating for hardness and working drives.